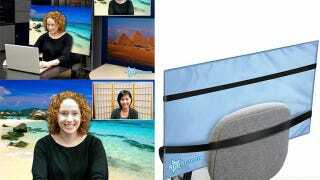 Not even a week into 2012 and we already got our eyes on the dumbest SkyMall contraption of the year: the StarScreen Social Backdrop, a piece of printed plastic that attaches to your chair to show a background when you videochat. Our delightful StarScreen Social Backdrops make video chatting and conferencing fun. It gives your chat buddy the illusion you're in a fresh and exotic environment. Convert your messy room in an instant. Show off new backdrop designs to all of your social network friends. Yes, my social network friends, you can turn your "messy room" into a beach, Mount Rushmore, Venice, Yosemite, Bora Bora, a night club... even another clean office. Seriously, who buys this crap? Do they realize that most videoconferencing software supports automatic background change (check the video and go to minute 3:28)? This plastic piece of solidified imbecility costs $30! Thirty bucks. Just insane.